Hi friends. With Easter Sunday around the corner, I thought it might be appropriate to take a few moments to reflect on God’s perfect sacrifice of His Son. Isaiah 53:5 sums up what Jesus truly did for us on that cross, and I’m going to discuss that verse today and what that means. Think of what it’s like getting a body piercing without any numbing aides. Think of a needle piercing a sensitive area of your body. Jesus suffered far worse piercings. He was pierced so fiercely all over His body for lowly sinners. The piercings were deep, and not gently performed. The lashings were ferocious. Christ took that pain and humiliation so that we could live. Only the true Messiah and Savior would suffer such pain for us. The definition if iniquity: Immoral or grossly unfair behavior. Think about the most immoral thing you have heard on the news or seen with your eyes. God sent His Son to be crushed for people such as these. Jesus was crushed for us! We are all guilty of sins and iniquities, and Jesus cared for us anyways. Christ our Lord was crushed. His bones were broken and literally crushed for us. He sacrificed Himself for such immoral and gross people such as us. I have never had a broken bone, but I can’t imagine that pain and heartache and discouragement that it can give. Jesus had bones broken and crushed all over for us, and He did this to pay the wages of our sins. We should always give thanks for that. We can have peace because of our dear Lord Jesus. I think about my dad and his death. I don’t think that I could have made it during that time in my life without Christ’s peace. I acknowledge that without Jesus taking the punishment for my sins and the sins of the world, I could not have that sweet peace of knowing my wonderful daddy made it to a beautiful heavenly home. Thank you sweet Lord Jesus for stepping up to the plate and taking the punishment of wounds, and scars, and broken bones, and humiliation so that us lowly humans could know what true and everlasting peace is. This is probably my favorite part of the verse. 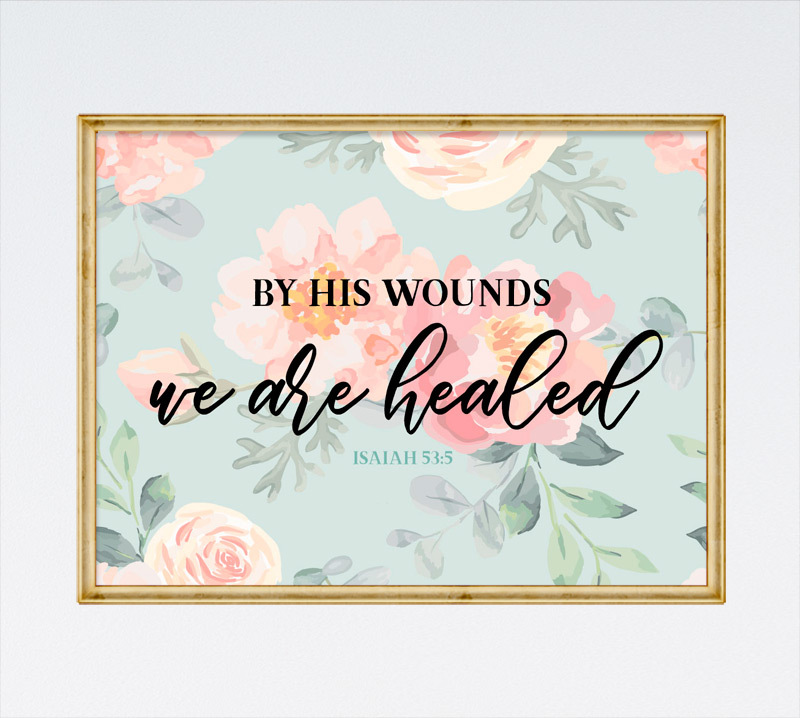 “By his wounds we are healed.” Think of a time when you were very sick and struggled deeply with it. Now think of the time that you had a treatment or medicine, or woke up feeling better from that terribly exhausting sickness. You were healed! You almost wanted to jump a mile high out of that bed didn’t you? It gives a person a burst of happiness, joy, and energy when they feel better after an illness. We should want to jump miles high every day as we remember Christ’s sacrifice. We are healed, but this time it is eternal. We sin daily and all fall short, but then God looks back to Christ’s sacrifice on the cross and shows us that sense of peace and love that lets us know we are healed. Only by the pain and suffering of Jesus were we permitted to receive such a miraculous healing. My heart aches inside when I remember all the pain and shame that Jesus went through for me. But I just want to leap for joy when I think of the wonderful healing that Jesus gave me. I have a new heart and hope for my future, and it’s all because of Jesus that I’m alive and can live forever. Thanks be to my Lord always! Thanks so much! You have a wonderful Easter! So much beautiful truth that was prophesied many years before it happened!